Clean Green Falafel - Underground Fitness Dun Laoghaire | Bray | Dublin & Wicklow - Personal Training, Group Training and Bootcamps. Heres one for our vegetarians! 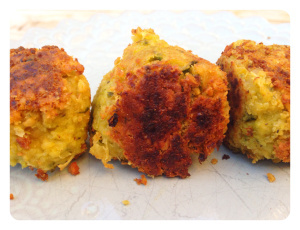 Falafel is a great alternative to meat for vegans thanks to the protein packed chickpeas and the iron-filled spinach. Start by draining the chickpeas and putting them in the food processor. Blend until you have a chunky paste. Then add in the corn and blend. Then the spinach and blend until its all mixed in. Next, add in the tahini, lemon juice, salt, pepper and spices and mix it all together. Next, put a pan on high heat and add a good chunk of coconut oil to the pan (enough to fill the whole bottom of the pan!) Let it melt and get really hot. Then pop the balls onto the pan and let them sizzle away. When they start to get brown and crispy, turn them over. Keep doing this until they’re crispy all the way around. Leave them on a little longer than you would think to make sure they cook all the way through, the crispier the better! Once they’re cooked serve them however you like. They’re great warm on top of a salad, with cos lettuce, red onions, tomatoes and a good drizzle of my Lemony Yoghurt Sauce.